“We decided not to mess with what’s working,” says Amazon devices VP Peter Larsen. That’s why his new Fire TV looks exactly the same. But inside this tiny box, you’ll find components powerful enough to stream 4K movies. It’s one more impulse buy from the kings of online shopping. Let’s dispose of the tech specs first. 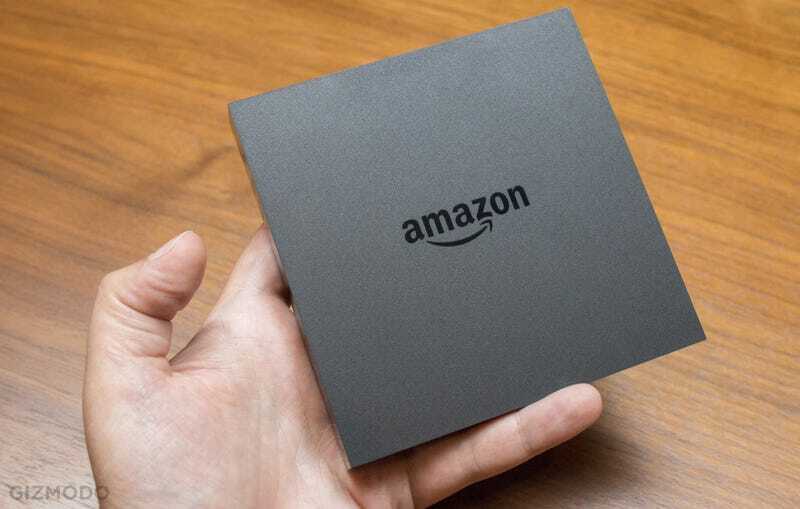 According to Amazon, the new Fire TV has a new quad-core, 64-bit MediaTek processor and a dedicated GPU, for 75% faster performance and twice the graphical muscle under the hood. It’s got 2x2 802.11ac MIMO wifi to keep those 4K streams flowing, and HEVC decoding so even your 1080p streams can look better. There’s a microSD card slot to boost the storage up to 128GB (it comes with just 8GB) for apps and games. Update: Amazon says it’s 4K movies where it holds the lead. Like before, the Fire TV’s bundled remote has a dedicated button (and microphone) for voice search, only now it does way, way more—because Amazon has integrated its Alexa voice assistant into the Fire TV as well. And early next year, you’ll be able to use it to actually instruct the Fire TV to launch a program. “Play Star Trek Into Darkness,” said our demonstrator. The movie starts right where you left off. And speaking of voice commands, they’re coming to the cheaper Fire TV Stick, too. The dongle will now come with a voice remote for $50, though you’ll still be able to buy it for $40 without. (Or you can just use a smartphone app to issue your commands.) It’ll be a free update for the original Fire TV box as well. Oh, and Amazon says the new remote is 20% faster, and lasts 40% longer on two AAA batteries. Up to 12 months of battery life. And if you buy your less-tech-savvy parents or grandparents a Fire TV, they’ll be able to use Amazon’s crazy Mayday feature to get a callback from a tech support rep who can actually take control of the TV and help them fix issues. You won’t see them pop up on the screen like with the Fire tablets—they’ll need their phone—but it’s still pretty cool. Last but not least, there’s a new optional $40 game controller with much improved buttons from the original, with a headphone jack for private listening (super useful) and a voice search button, too. Though if you want the game controller, you should probably pick up the new Fire TV Gaming Edition instead. It comes with the gamepad instead of the traditional remote, plus a 32GB microSD card and copies of Ducktales Remastered and Shovel Knight (both awesome games) for $140. Hard to say yet if it’s a better choice than an Apple TV or Roku or Shield or any of your other streaming choices, but we’re definitely looking forward to giving it a go. The new Fire TV will ship October 5th, and the Fire TV Stick with voice remote is due October 22nd. Contact the author at @starfire2258.